Opened in 1996, this five-star property is managed by Singaporean-based Keppel Land Hospitality Management. It recently upgraded all of its 366 rooms and in October 2015 it unveiled a new 29-storey Inya Wing, comprising 431 luxury rooms and suites. The hotel gets its name “Sedona” from the pure white Dendrobium Sedona orchid, bred in 1984 at the Singapore Botanic Gardens. Situated by Inya Lake, approximately halfway between the airport and downtown Yangon – both 20 minutes away in light traffic (although getting to the city centre can take over an hour at peak times). From lake-view rooms, the residence of Aung San Suu Kyi can be seen, while the city’s famous Shwedagon Pagoda is also visible in the distance. 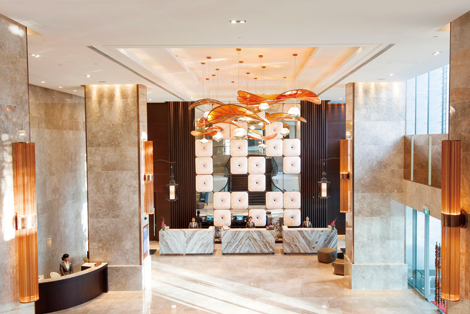 Inya wing features a stunning marble-clad lobby, with a double-height ceiling to show off hanging Pathein-umbrella sculptures. Personal attendants helped us to check in and the service was very friendly – though perhaps not quite as slick as other five-star establishments. My Premier Deluxe room in the new Inya Wing was a comfortable size at 33 sqm, modern and in mint condition. Again, the distinctive indigenous design stood out: the motif of traditional Burmese Pathein umbrellas subtly appeared in the colourful rug, artwork and as a pair of cream upside-down umbrella lampshades either side of the large bed. Other ethnic touches included large lacquered lamps resembling local rice storage bowl lids, and fresh orchids – a nod to the hotel’s namesake. The overall effect was luxurious, warm and inviting. The desk in the study area was not the most practical I’ve seen – made of glass, there were no drawers, and the phone was by the bedside, but it was fairly spacious and had access to universal plugs. There were also universal plugs by the bedside cabinet, and fast, complimentary wifi. The wall-mounted cable TV offers a decent number of English-language channels and the complimentary minibar provides a selection of beer, soft drinks and snacks. There was a glass partition separating the bathroom, with a blind for privacy. The bathroom was a good size, with a powerful shower plus a bath. I was delighted to find L’Occitane toiletries, including shampoo and shower gel, but disappointed by the lack of conditioner. Otherwise, the bathroom amenities were comprehensive. The Executive Club Lounge in the Inya Wing is opening soon. Meanwhile, the Garden Wing offers an elegant and modern Club Lounge with great views over Inya Lake. All-day refreshments are available, including a buffet breakfast and light dinner offering. There are computer facilities, plus a business centre with small meeting room. Club and Suite guests are entitled to additional benefits, such as pressing of two clothes items per day. (7-9pm). Italian fare is available at the restaurant’s Orzo restaurant, while Du Fu serves classic Chinese cuisine. Relaxing music is performed live in the Lobby Lounge, while Ice Bar provides an up-tempo nightclub experience, with a full Filipino band performing every evening. There are eight well-equipped function rooms of various sizes, accommodating between 10 and 180, plus a grand ballroom that can accommodate up to 1,000. Real Fitness Signature Club is the largest gym in Yangon, a spacious, well-equipped centre offering everything from a stretch wall and powerplate machine, to Zumba and Body Combat classes, plus a steam room, sauna and Jacuzzi. Annual membership is US$3,600 per year, although guests can use the facilities for free. A lovely lagoon-shaped outdoor pool (also the largest in the city) comes complete with a tantalising pool bar, though as far as I saw, not a soul made use of it during my stay. An onsite shopping arcade connects the two towers, with some high fashion names including Swiss watchmaker Franck Muller. A beautiful hotel with a memorable design. Onsite facilities were comprehensive and service was warm and friendly. The location is also excellent – peaceful and convenient for both business and leisure guests. HOW MANY ROOMS? There are 797 rooms in total: 366 split between four categories (Superior, Deluxe, Club Deluxe and Club Premier) plus a range of suites in the Garden Wing, and 431 Premier Deluxe rooms and suites in the Inya Wing. HIGHLIGHTS The design of the hotel and guestrooms stick out in an increasingly homogeneous hospitality landscape, while the views and location were both tranquil and convenient. PRICE Internet rates for a Premier Deluxe room midweek in mid-May start from US$245 per night.